A new version of the Cerber ransomware family has adopted new techniques to make itself harder to detect by endpoint security software that uses machine learning for detection. It is now using a new loader designed to hollow out a normal process where the code of Cerber is run instead. Cerber reared its ugly head March last year and has rapidly grabbed marketshare by furiously innovating and using different attack vectors and distributions channels. It spreads mostly through phishing emails, but also uses exploit kits. In August 2016, Invincea researchers discovered that Cerber was being distributed by Betabot, which was designed as a banking information stealing Trojan but recycled for ransomware. Recently, Cyren researchers reported that Cerber is being dropped by Kovter, a click-fraud Trojan which was dropping Locky several months ago. Trend Micro reports that the new loader was necessary because machine learning security code detect malicious files based on features instead of signatures. The new packaging and loading mechanism employed by Cerber can cause problems for static machine learning approaches–i.e, methods that analyze a file without any execution or emulation. In other words, the way Cerber is packaged could be said to be designed to evade machine learning file detection. For every new malware detection technique, an equivalent evasion technique is created out of necessity. And of course you want to step all your end-users through new-school security awareness training, so that they spot the phishing emails when they make it through all the filters. We're excited to announce a new resource for you, our new Ransomware Simulator. How vulnerable is your network against ransomware? Bad guys are constantly coming out with new versions of ransomware strains to evade detection. 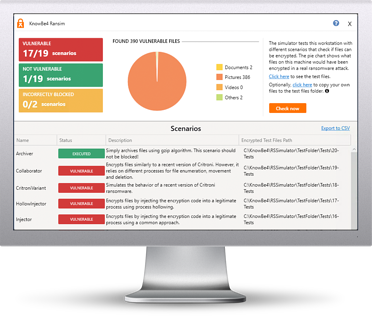 Is your network effective in blocking ransomware when employees fall for social engineering attacks KnowBe4’s Ransomware Simulator "RanSim" gives you a quick look at the effectiveness of your existing network protection. RanSim will simulate 10 ransomware infection scenarios and show you if a workstation is vulnerable to infection.